There is a Marathon on Sunday morning between Nice and Cannes. If you normally use the Promenade to drive to church, you will need to take an alternate route. Sunday, November 4, All Saints & All Souls (transferred) Sung Eucharist at 11 a.m. Names of those to be remembered will be read during our prayers. Collection for Fourneau Economique after the Eucharist. Curry Lunch at 12.30 pm. Wednesday, November 7, Eucharist at 10.30 a.m.
Sunday, November 11, Remembrance Sunday: Sung Eucharist at 11 a.m. Concert at 4 pm: Dvorak’s New World Symphony conducted by Matthieu Peyregne. Saturday, November 17, St Hugh’s Day Sung Eucharist, at 11 a.m., at St Hugh’s, followed by lunch. If you’d like to attend, please email or phone Claire Ery, St Hugh’s Church Warden: 06 83 97 87 68; mc.ery@live.fr to reserve a place at lunch. There will be no Sunday Eucharist on November 18; the St Hugh’s Day celebration is in lieu. The presbytery in Nice is next to a flower shop and it’s fascinating to watch French customs reflected in their trade. Particularly poignant was the queue, literally round the block, in the days after the July 14 attack two years ago. On May 1, we have lilies of the valley, muguet. On Valentine’s day, there are innumerable bouquets of red roses. At All Saints’ and All Souls’, endless chrysanthemums. I first encountered chrysanthemums at this time of year when I was on holiday at the end of October. We’d crossed the Channel and stopped at the small town of Ardres for the night. Two memories remain. As we were having breakfast, a group of men came in, dressed for shooting, and had coffee and cognac before they went off to hunt. Outside the hotel was a market stall selling chrysanthemums. The men drinking before shooting and the chrysanthemums puzzled me. It seems that the chasseurs were taking the French equivalent of a stirrup cup. I discovered that the flowers were for placing on graves at Toussaint, All Saints’, which is the reason that chrysanthemums are never given as a present here although people commonly buy them from supermarkets in the UK to have as a bouquet at home. Customs about flowers and colours for mourning vary widely throughout the world and their origins are obscure. Perhaps the All Saints’ (Toussaint) customs go back to the Roman custom of the Feast of the Lemures (Lemuria), celebrated on November 1, in which the malevolent and restless spirits of the dead were propitiated. Another influence may be the Celtic holiday of Samhain, also celebrated on November 1, which combined a similar theme to the Roman festival with harvest festival. The Feast of All Hallows (the old word for Saints) displaced this – just as other Christian festivals deliberately displaced pagan ones. This explains why the American celebration of Halloween and All Saints has pumpkins – fruits of the autumn harvest – as well as dressing up to scare away evil spirits. 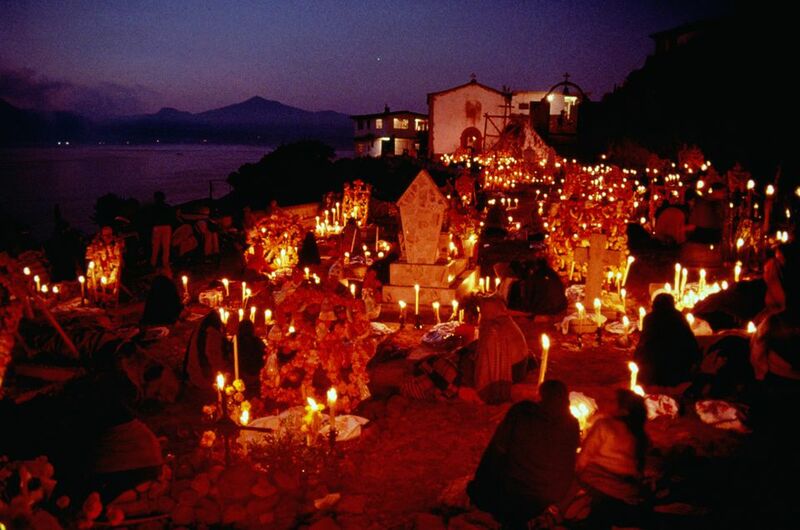 In many traditionally Catholic countries – particularly in Latin America – All Saints’ and All Souls’ have evolved into a two or three-day festival remembering the dead, beginning on October 31 and culminating with November 2, All Souls’ Day, also known as ‘The Day of the Dead’. Once customs develop like this and become so embedded in our cultures, it becomes difficult to unravel the religious part or explain its meaning. For most Christians, All Saints’ Day is the occasion to remember all the saints, not just those who have a designated, named day, but also those of every generation who were saints but whose names are now unknown. Some extend this to mean all baptised Christians. St Paul refers to the Corinthian Christians as ‘those sanctified in Christ Jesus, called to be saints’ (I Cor. 2). The inclusion of all the baptised in the category of ‘saint’ is useful as it’s too easy to set the bar for sanctity so high that we are discouraged from aspiring to it. I believe that there are many moments when the people we know exhibit sanctity, when they point to the ‘thinness’ that exists between ordinary experience and the presence of God. It may be the expression of joy on a child’s face, ‘inspired’ music making, the work of a great artist, or the look of compassion on the face of someone caring for the needs of another. All Souls’ Day, November 2, continues the theme of sanctity. We remember all that was good or life-enhancing about those who have gone before us. We commemorate and give thanks for their lives and remember them. We do this in many ways. 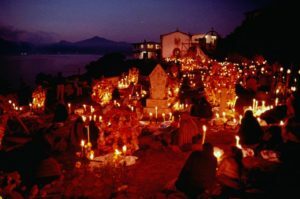 In the Day of the Dead commemoration, people go to the graves of their loved ones, decorate them and light candles and celebrate their lives. In France and other parts of Europe, many people also go to their relatives’ graves and put flowers on them. Or, as happened at the Eucharist on November 1 and will happen again on Sunday, we may simply remember those whom we have loved who have died and call out their names in prayer.